Australian child star Molly Daniels DRESSED AS A STAR! Full disclosure: the only reason I first attended the variety show the Curio Show was to see my friend and colleague Gwynedd Stuart perform a reading making fun of the cable access TV show Stairway to Stardom. Those familiar with her work here at the Reader know she's one of the best when it comes to pop-culture takedowns, so I knew that she at least would entertain even if the other performers flopped. Because that's the thing about "variety shows." There's always a chance that one performer could be amazing and another could completely fumble. But thanks to creator and host Irene Marquette's odd obsessions and careful curation, the Curio Show is consistently entertaining—and educational. Marquette invites comedians, musicians, magicians, writers, and artists of all sort to do whatever they like as long as it stays within the month's chosen theme. The most recent performance was all about starlets, which resulted in a tutorial on Paris Hilton's beauty regime, a burlesque dance, and a performance by a real-life child actress (Molly Daniels was a cast member on the Australian kids' sketch-comedy show You're Skitting Me). Marquette, who chooses each month's theme based on her own curiosities, popped out between guests to share well-researched and compelling stories of old Hollywood actresses as well as her own history of performing in front of the mirror as a child hoping to be discovered by a talent agent on the other side. Past themes have included "cults," "tabloids," and "Bluebeard," and while I have no idea what Marquette will choose to explore next, I can't wait to go down the rabbit hole with her. The Mission Theater, one of four stages at iO, was created with the, well, mission of producing more out-of-the-box shows that don't necessarily fit into the theater's "yes, and . . . " environment. While it's dominated by the improv and sketch shows of TJ Jagodowski and Dave Pasquesi, Tuesday nights are open for variety shows, performance artists, musicians, and whoever else might need a place to perform. Marquette and her show are the perfect fit for the slot, and an exciting reminder of what kind of work is needed to shake up the comedy community. 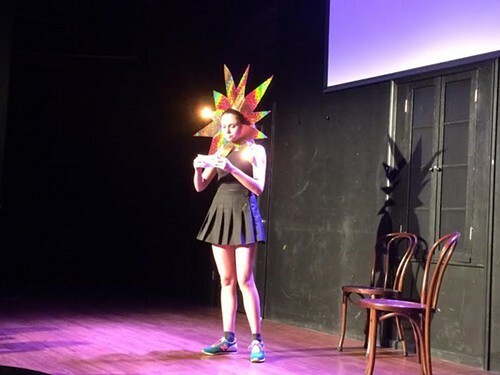 People may come to iO for long-form improv, but the Curio Show is proof that some of the most delightful things happening at the theater are hidden in Tuesday-night variety shows. The Curio Show, 8 PM, last Tuesday of the month, iO Theater, 1501 N. Kingsbury, facebook.com/thecurioshow, $7. Despite news reports to the contrary, TJ and Dave's departure does not spell the end of iO's Mission Theater.